As someone who runs or works out six days a week, I was unnaturally concerned by what California had to offer me. How on earth was I going to get my gym fitness fix in a setting like this? I needn't have worried. I got active, in the most natural way. When I looked at my itinerary for California it made me a little anxious. While we would be visiting Yosemite National Park and enjoying all it had to offer, we were staying in a series of remote cabins. Cabins that didn't include a fitness centre, and outdoor terrain which didn't include a running track. As someone who runs or works out six days a week, I was unnaturally concerned. How on earth was I going to get my gym fitness fix in a setting like this? I needn't have worried. I got active, in the most natural way. Hiking: Hiking through Yosemite is not for the faint of heart. We chose a "moderate" trail which was one of the most challenging I've ever been on. However, climbing to an elevation of 8,200 feet and gazing out over Sentinel Dome onto Yosemite Falls, makes it more than worthwhile for the five miles of hiking a trail which alternates between muddy branch filled trails, and spring snow. Over four million visitors to Yosemite National Park can't be wrong. The toughest stair climber I've been on. Even without my morning 5k run, I hit 32,000 steps on my Fitbit. Biking: Spin class has nothing on taking a bike through Yosemite down 12 miles of paved trails. There are hills to cycle, waterfalls to ride by, and heart stopping glimpses of climbers on the sheer rock face of El Capitan. The bike trails lead to the Majestic Yosemite Hotel, settled in the heart of the park. Built in 1927 this truly majestic hotel captures both grand resort charm and forest elegance. Fly Fishing: Fly fishing appears to be a Zen and relaxing experience. This might be true if you are an experienced fisherman. But for me, hauling on hip waders and stepping into the Stanislaus River with its strong current, I found some new muscles. The ones that stopped my boots from slipping on the river rocks, triceps and forearm as I repeatedly flicked the line into the water, and the quick dodging while trying to avoid shooting my (actual) fly and its associated hook into my face. I'm just as stressed out at yoga, myself. Hill Running: At a 4,000 foot elevation, my breath was not only taken away by the gorgeous scenery at Evergreen Lodge but going for a hill run down and around the paths had me gasping for air long before I'd have felt it on the treadmill in my climate controlled gym. Fortunately the lodge features an outdoor swimming pool. Unfortunately it also features a gourmet restaurant and s'mores basically on-tap. Kayaking: A real life rowing machine. We paddled out from Pier 40 and kayaked under the Bay Bridge, and then back around AT&T Park in San Francisco Bay. Arm work out? My muscles say yes. It was with some relief that I finished off at the Westin St Francis in San Francisco, where I welcomed the relative ease of a 5k treadmill run. Fit it all, in. Kathy visited Tuolumne County, Mariposa County and San Francisco. An excerpt of this article originally ran in the Metro News. 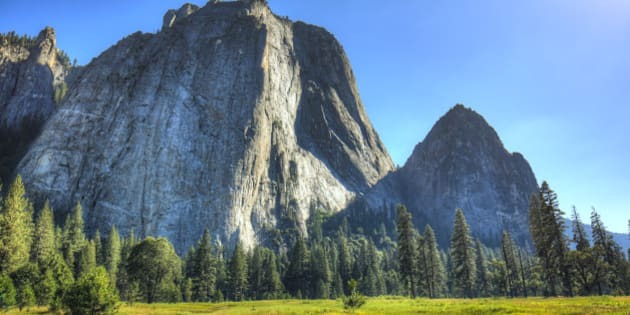 Watch for Kathy's "Get Set, Go" travel segment on CHCH TV Morning Live on June 23rd, featuring Yosemite National Park, and all you need to take to have a successful trip.